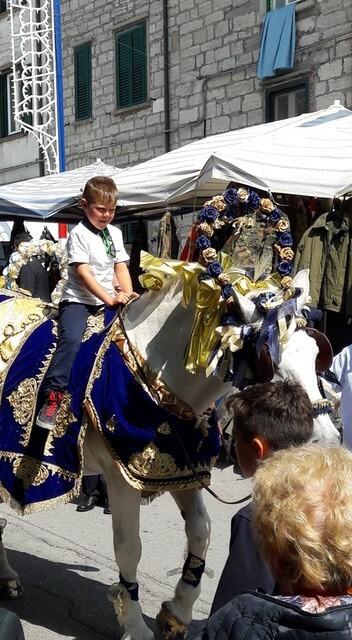 In this week’s #NIAFblog, our guest blogger, Jenifer Landor – founder of Live and Learn Italian – offers a fascinating look into the culture and traditions of small Italian towns in the Apennine hills. We go up the mountain road, to 1421 meters, putting on an extra layer of clothing as the car climbs. 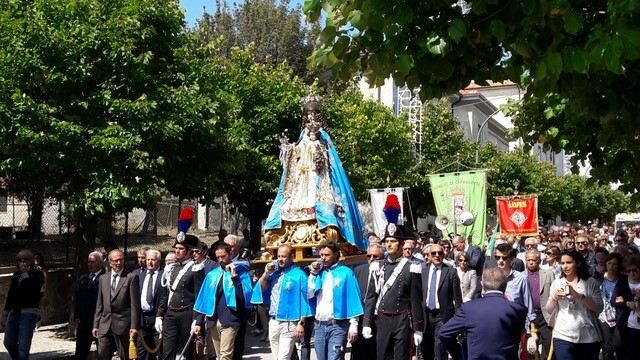 Every three years, hundreds from around the world are welcomed back to honor the Madonna di Loreto over three days of festa, in the little Apennine paese of Capracotta. Following World War II, they suffered massive immigration that decreased the population, but the Capracottesi remain profoundly attached to their town. Although once a prosperous place of shepherds and sheep, it was still a very hard life. Since ancient times, each autumn, thousands of sheep were herded down the tratturi (the wide mountain paths) to the plains of Puglia for winter. This was called la Transumanza. Families in Capracotta, without their menfolk during the freezing winter months, were drawn together; the shepherds supported each other far from home. Those ties remain strong today across generations and continents, the passionate connection to their land, is moving to witness. 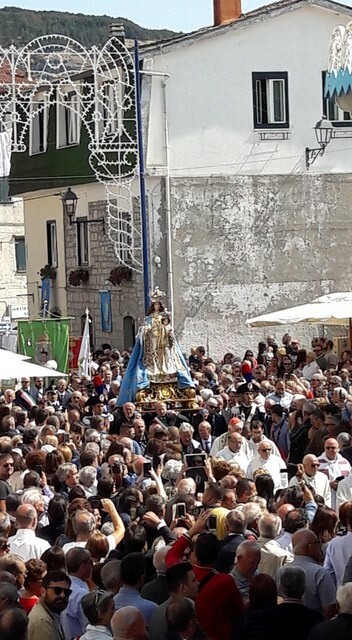 At dusk on September 7th, the statue of the Madonna is taken in a solemn procession from its sanctuary, at the entrance of the town, to the chiesa madre, Santa Maria Assunta in Cielo. Escorted by 30 horses and 10 donkeys, she is carried by the townsfolk, men and women. Names are drawn to select 466 people, who are then divided into 79 “porter teams,” throughout the 3 days. Alongside daily processions and mass, the streets are full of market stalls, food, games, band music, and dancing. 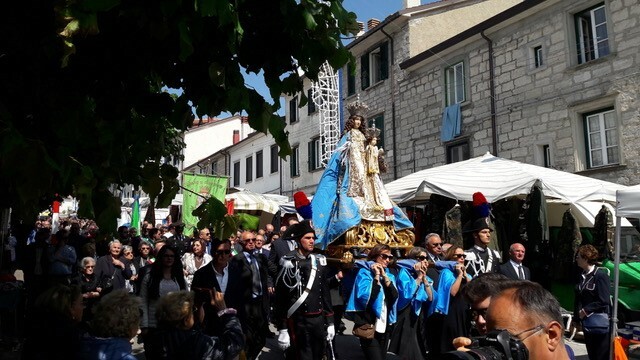 We went on the final day, to see the Madonna carried down the hill, back to the sanctuary. 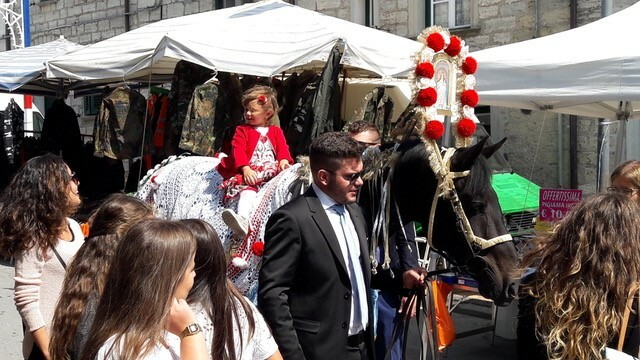 The accompanying horses and donkeys were in what can only be described as “fancy dress!” Elaborate, hand-embroidered blankets, lace coverlets, headdresses and harnesses, created each year by family teams. 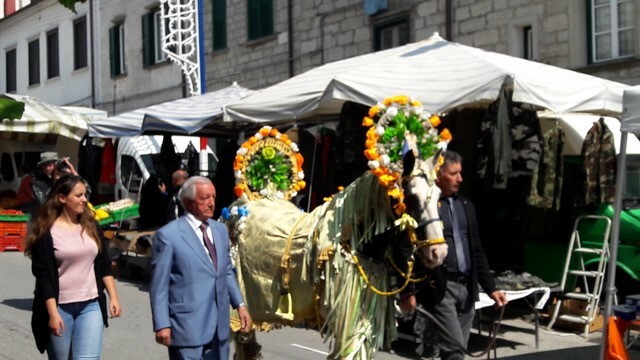 It’s a long-standing tradition to embellish the horses with the finest mantels and fabrics possible, as an offering to the Madonna. It is sobering to note that in times gone by, the end of the festa meant the shepherds would start their trek down the mountains, leaving families through the long winter. Today, Capracotta still produces fine cheeses, but the small remaining herds are kept warm inside throughout the cold months. A stunning, dramatic, unspoiled landscape; winter offers cross-country and downhill skiing and trekking, in summer, rock climbing, hiking and horseback riding. A simple life – ancient traditions, hard work and beautiful nature bind this unique community. The proceedings were humble, and in some way unsophisticated – rough almost. Shiny little blue capes, worn by the porters, covered simple attire, but lent a dignity and gravitas. The pride of the citizens and love for their Madonna was extraordinary to witness. Another incredible event of the summer, in a region full of tradition and history. LIVE AND LEARN ITALIAN invites you to combine Italian study with exploring the traditions and everyday life of the region, mixing with the community and engaging in local activities. Image | This entry was posted in Cooking, Culture, Documentary, Europe, Family, Food, Heritage, History, International, Italian, Italian American, Italian Food, Italy, Photographer, Uncategorized, Writer and tagged Appenine, Autumn, Capracotta, Catholic, Catholic Church, Catholicism, Christian Traditions, Donkey, Donkeys, Fall, Horses, Italian, Italian culture, Italian Food, Italian Heritage, Italian History, Italian Music, Italian Traditions, Italy, La Madonna, La Madonna di Loreto, La Transumanza, Madonna, Procession, Puglia, September, Sheep, Shepherd, Southern Italy, Summer, Traditions. Bookmark the permalink.